The 11th Isle of Man International Go Festival finished up on Friday August 23, bringing an end to a week of go and social activities for about fifty players. The Festival, which opened on August 18, hosted three tournaments, the Main, Afternoon and Handicap. The Main was taken with a 5-game sweep by former British and European Champion Matthew MacFadyen 6d of Leamington, UK, with Matthew Cocke 5d of Epsom, UK in second and Piers Shepperson 4d, also of Epsom, third. Click here for full results. In the shorter Afternoon tourney, Shigehiko Uno 4d of the Nihon Ki-in in Tokyo prevailed with a full three wins, while James Hutchinson 1d of Belfast took second place and Toby Manning 2d of Leicester, UK third. Click here for full results. The handicap tournament was won by young Edmund Smith 15k of Milton School, who beat Oscar Selby 11k in the final round. Richard Hunter 3d of Bristol won the 13×13 event. The Japanese husband and wife team of Shigehiko Uno 4d and Keiko Uno 20k won the rengo. The event took place at the Cherry Orchard Apartments in Port Erin on the Isle of Man, a small island off the west coast of Scotland. Although it is one of the British Isles, it is not strictly part of the UK, being a self-governing British Crown Dependency. It is perhaps most well-known internationally for the TT motorcycle races. Click here for the preliminary report on the British Go Association website, and here for an updated report of prize-winners and side events. Tony Collman, British Correspondent for the E-J. photo by Seamus Whelan, courtesy of Cherry Orchard Apartments‘ website. NOTE: this post was updated 8/27 with several corrections and the handicap tourney results. Russia: Less than ten days after his victories at the 2013 European Go Congress, Ilja Shikshin 7d (left) conquered the Vladimir Open in Suzdal on August 18. Igor Nemlij 5d placed second and Dmitrij Surin 6d came in third. Poland: The Summer Go School – Jerzy Sacharewicz Memorial tournament in Przystanek Alaska also finished on August 18 with Cezary Czernecki 3d in first, Stanislaw Frejlak 4d in second, and Marek Kaminski 4d in third. Sweden: Fredrik Blomback 6d bested Yaqi Fu 6d at the Stockholm Open on August 18; Klas Almrot 4d came in third. 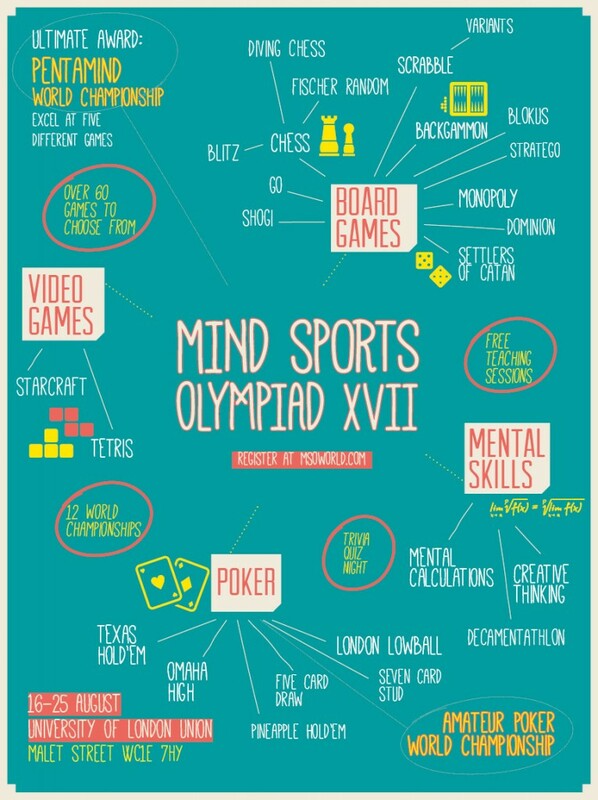 A 10-day “Festival for the Mind”, the 17th Mind Sports Olympiad (MSO) opened in London on Friday 16 August, hosting a myriad of mind sport competitions, including the Creative Thinking World Championship, Hare and Tortoise, Chess – and variations on it, some novel such as Diving Chess – and last, but not least, go. There will be a free introduction to go on the morning of Saturday, August 24, followed by the 13×13 competition that afternoon. The next day will see the all-day 19×19 go tournament, a 4-round McMahon, 40 minutes each main time + 30 moves in 5 minutes overtime. Entry is £10 per event (single session) or £15 (double session) and it is being held at the University of London Union, Malet St, London, United Kingdom, WC1E 7HY. Click here for a full schedule of events. Tony Collman, British Correspondent for the E-Journal. Photo: Mind Map, courtesy of MSO website. The delicate dance between Hui Fan 7d (left), Pavol Lisy 6d, and Mateusz Surma 6d at this year’s European Go Congress in Olsztyn ended on August 10 when Fan snagged the spotlight after a final showdown with Lisy. It is Fan’s third title in three weeks and the second time he and Lisy have had a face-off. Unfortunately for Lisy, Fan repeated his performance at the Beijing 2013 qualification tournament on July 22 and successfully edged him out. Though fan favorite Ilja Shikshin 7d fell short of the top five in the main tournament, he won both the weekend tournament and the blitz knock-out. In the U18 tournament, fellow Russian Alexandr Vashurov 5d took first while Jonas Welticke 5d placed second and Roman Lemasson 3d came in third. For photos and full results from all the go tournaments at this year’s European Go Congress, visit the EGC 2013 official website. Turkey: The 13th Istanbul Go Tournament will take place September 28 and 29 in Istanbul. Since fall 2001, the Istanbul Go Tournament has made its players its top priority. According to the official homepage, the Istanbul Go Topluluğu has “always been striving to achieve a higher quality of experience…and set a higher standard for other national tournaments in Turkey.” All players are invited to register. Pre-registration is open until September 20 and strongly encouraged. For official rules, full schedule, and more, please visit istanbulgo.org. Italy: The Higashikita Go Club and Italian Go Federation (F.I.G.G.) will host the 2013 European Student Go Championship and 8th Higashikita Tournament on October 5-6 in Trieste. For the main tournament, any player that is a university student, under 30 years of age, and a citizen of any EGF member countries is invited to participate. There is no entry fee and if a country chooses to elect an official national representative, that player will receive free accommodations. For players who do not qualify for the main tournament, the Higashikita Tournament is open to all players. Players who register for the Higashikita Tournament before September 29 will receive a 30% discount on their entry fee. For more information about or to register for either tournament, please visit the ESGC 2013 official website. The British Go Association’s (BGA) ratings list and Organisers Handbooks will continue to be publicly available on the BGA’s website, which last week launched a member’s-only section. Plans to remove much previously public information, including ratings, had met with opposition (Brits “Members-Only” Website Move Sparks Debate 7/21 EJ) and following a period of consultation, BGA President Jon Diamond announced that the ratings, handbooks and “some of the Policies which may be clearly relevant to non-members (such as Child Protection)” would remain public. Material on the Members’ Section includes electronic versions of the British Go Journals for the last year, PDFs, SGFs and problems/solutions, Council meetings and Annual General Meeting Minutes, Annual Accounts, Policies and Archive contents. Click here for full details. -Tony Collman, British Correspondent for the E-Journal. U.S. players Benjamin Lockhart and Eric Lui defeated Rob van Zeist (Netherlands) and Cristian Pop (Romania) in the “world group” of the Samsung preliminary in the first round on August 5. In other world group play, Oleg Mezhov (Russia) defeated Yinli Wang (US) and Jan Hora (Czech) defeated Yunxuang Li (US); the next round on Tuesday will pit Mezhov vs. Lockhart and Lui vs. Hora. The only US professional playing in the preliminary, Zhujiu (Jujo) Jiang, lost in the first round Sunday to Komatsu Hideki of Japan. Sweden: Recently, Leksand hosted both the Leksand Open and the European Women’s Go Championship. 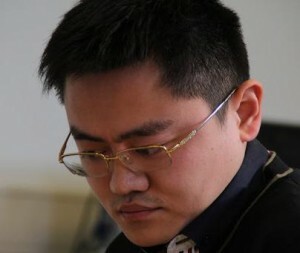 Even though he had triumphed at the EGF Qualification tournament for Beijing 2013 two days before, Hui Fan 7d championed the Leksand Open on July 24 with Ali Jabarin 6d in second and Cristian Pop 6d in third. 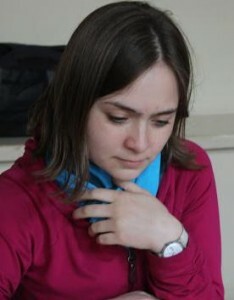 The same day, victory at the European Women’s Go Championship belonged to Natalia Kovaleva 5d (left) while Dina Burdakova 5k placed second and Manja Marz 3d came in third. Croatia: The 475. Velika Gorica weekend go tournament finished July 27 with Mladen Smud 1k in first, Nikola Primetica 4k in second, and MIrko Primetica 9k in third. Romania: Catalina Bianca Tudosie 12k took first at the TrSeverin – Under 16 club tournament on July 28 in Drobeta-Turnu Severin. In second was Catalin Fabian Birlan 12k and third was Marina Popa 16k.